Last month (May17) the Roar singer landed a historic multi-million dollar gig as a judge on the reality TV singing competition, reportedly picking up $25 million (£19 million) to advise wannabes. And Diplo, who was romantically linked to Katy in 2014, has been working alongside his former flame by participating in active discussions with American Idol bosses. “I’ve also been talking to American Idol on the side to try to help them with the (ABC network reboot) with Katy," he tells Billboard, without providing further details about his role on the show. "I just like the idea of working with them. They’re cool," he added. 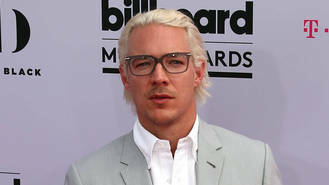 Diplo, real name Thomas Wesley Pentz, has been involved in a number of projects of late - in addition to working on music with his band Major Lazer, the business savvy 38-year-old also runs record label Mad Decent, writes music for the likes of Beyonce and Madonna, and invests his money in big-time tech companies like Snapchat and Tesla. But Diplo has been concentrating a lot of his energy on television lately - a series about his life, called What Would Diplo Do? - starring James Van Der Beek, was recently picked up and executives at America's NBC network have also given a competition show idea of his the go-ahead. The multi-talented musician appreciates all of the opportunities because he's trying to emulate his late idol David Bowie. “I go to Vegas, and every dude is the exact same guy,” Diplo explains. “Every DJ looks exactly like The Chainsmokers! So freeing up my image is really important to me. That’s what Bowie did. Every f**king four months the guy was like a new human being."